Best of luck to everyone who will be off running the Hartford and Chicago marathons!! For the rest of you with a race in the near future, let’s enjoy this last week of the formal SLR program! 12.5 miles for those choosing to run the long route; 7.1 miles for those choosing the short long route; and the option to run more or less, depending on where you are in your training. Those of you running later marathons will continue on your journey to the starting line with freedom to run when you want and where you want. Stay the course. This Sunday, we’ll start out Main Street going North up to Ell Pond. Give the Clarence DeMar monument a little tap, from one great marathoner to another. Then turn left on Melrose St down to a left on the Lynn Fells. Follow the Lynn Fells onto the Fellsway East to Highland Ave. Take the right and head up to the water stop (thank you, AJ, for being there for us this week). Out of the water stop, everyone go straight past the hockey rink, long and short runners! 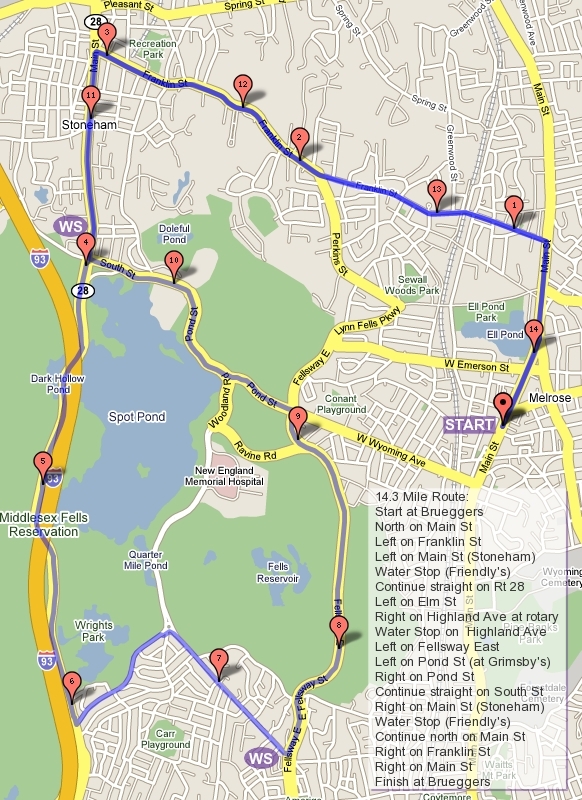 Short runners will turn down Pond Street to Wyoming and finish up a nice short run ready to run a half marathons The longer runners will loop Spot Pond counterclockwise. Yes, counterclockwise. As Jim puts it, you’ll see the pond a whole different way this way going in this direction… especially when you run up Elm St to turn right on Highland back to the water stop. From the water stop you’ll head over to East Border Road, take a left on the Fellsway, take on a couple more hills and then take a right when you hit Grimsby’s. Go down West Wyoming and left on Main Street and stop at a runner friendly place called Bruegger’s. Oh, right, you know that place, don’t you? I would be remiss not to mention that many of you are in or will shortly be in the ‘Don’t Do Anything Stupid’ phase of training. For those of you new to this phase, it means don’t think that since you’re tapering or since you’re so fit now that you can go out and try something that could very well interfere with all of your good work in getting to where you are. So… NO skydiving (unless it’s your job), NO crazy diets, NO taking up a brand new sport that will just tax you and get you sore in new places, NO boulder lifting, bee keeping, climbing trees to get apples (unless, again, this is something you already do), and the list goes on. You can, however, go to yoga class. Just kidding (no, I’m not). There is only one water stop with this course, and gratitude goes to AJ for agreeing to park on Highland and have all that you need to keep rocking the roadways. If someone else would like to be at Straw Point for bonus stop, let me know and I’ll have some supplies for you. So who is in for this final frolic of the formal season? Roll Call!!! Yes, we’ve all done it. At some point after we’ve done some distance we become the annoying person who states something like ‘oh, I’m only running 15 miles tomorrow.” Saying this to your non-runner friends, although innocent enough, typically doesn’t earn you any friend points. You might get rolling eyes or sarcastic lip pursing, but you likely won’t be handed a cookie to carbo load. So, 14.8 miles for the marathon runners (tapah time, doo doo doo doo, doo doo, doo, doo, can’t touch this) and just over 7 miles for the half marathon runners. And, of course, anything in between and beyond. The course is pretty simple. Starts with a nice loop around Swain’s Pond, then over the Fellsway to Saugus, Main Street to Farm Street, down sweet ole Nahant Street. Once you get to Main St from Nahant, smooth sailing back to Bruegger’s. CHECK OUT THE MAPS AND KNOW WHERE YOU’RE GOING, PLEASE. As for water stops… Jason will be there for you at the Citizen’s Bank in Malden and Don will be waiting for you at the Knoll. Since no one else offered to help, you’ll likely see one of them again at Nick’s Pizza. I’m sorry I can’t be with you for the run on Sunday, but I’m sure you’ll be as courteous and grateful to Jason and Don as you have been to me and others. Thank you in advance, Jason and Don. So – who is in for another beautiful Sunday long run that, don’t forget this, is getting you ready to tackle your big race. Continue to treat it as a training run. It might feel easy to run shorter than last week, but it’s shorter on purpose. Do all the things you would do for race day – breakfast, clothes choices, hydration – but take it easy. You’re very close to the ‘Don’t Do Anything Stupid’ phase of training. Okay, who is in and for how many miles? Roll Call! !